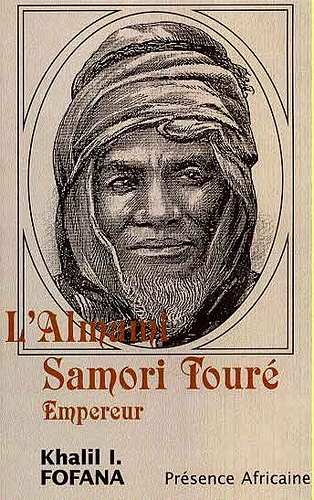 All, I am giving you below a portrait of Samori Touré made by Commandant Binger, a contemporary of Samori Touré, one of the great kings and fighters for African freedom. Bear in mind that this description is certainly tainted by the European (Binger) colonizer’s stereotypes of Africans. The original text in French is found on page 255 of Les Africains, Tome 1. Translation to English by Dr. Y. Afrolegends.com. Enjoy! The almamy is a tall handsome man of about 50 years of age; his features are a bit hard, and, unlike men of his race, he has a long slim nose, which gives a refined expression to his entire physiognomy; his eyes are very mobile, but he does not often look across his interlocutor. His exterior appears to me affable rather than hard: very attentive when a compliment is made to him, he can be distracted and indifferent when he does not want to answer a question categorically. He speaks with great volubility, and I think him capable of being warm and persuasive when the occasion arises. Sitting in a cotton hammock with white and blue rays brought to him from Paris by his son, he holds in his hands, a big piece of tender wood which is called in Bambara niendossila, or ngossé (it is sotiou in Wolof) and with which he cleans his teeth. He is dressed with a big doroké in purple florence, of inferior quality, and wears indigenous cotton pants with black and red rays of European make; his legs, a brown chocolate lighter than his face, are coated with shea butter; he is wearing indigenous red leather sandals. On his head is a red fez of sharpshooter around which is wrapped a thin white turban which goes on his mouth and frames his black face. On his shoulders, he negligently wears a haïk of low price. 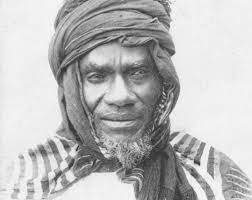 Sitting at his feet are: an old kokisi who never leaves him, two marabouts, a few griots, and the four captives assigned to the hammock, the chair, the camping bowl in which he washes his hands, and the kettle containing water for occasional rinsing of the mouth. These objects and captives rarely leave his side; wherever he goes, this paraphernalia follows. Within his reach, and under the same shelter (sort of shed to which the hammock is docked), two tailors are busy sewing yellow florence for his wives. One of the griots carries a big red umbrella, while the other one carries a crank-rod gun. All the objects mentioned above are of English make, except the hammock and the camping bowl, which is a regular bowl.